Today is National Play Day, an annual event held on the first Wednesday in August, which doubles as a celebration of children’s right to play and a campaign highlighting the importance of play in children’s lives. This is something I am passionate about encouraging and is very close to my heart. Bewilderwood originates from a story written by Tom Blofeld and has grown into a fantastic outdoor, forest based fun theme park. It is located close to Norwich in North Norfolk and when we were camping in the area we knew this was going to be our Number One place to visit! We love forests and having outdoor fun but this takes things to a whole new level – set amongst the forest – high in the trees! It is also a place adults can join in the fun, playing with their children! Even though it was raining when we were there it felt like we were sheltered from the downpours by the tree top cover. When you get into the park (car parking is free) you have the choice of walking or getting a boat ride from the entrance into the main area. There was a thirty minute queue for the boat so we decided to walk through the forest on wooden decking, looking at the little houses built into the trees, that set the scene for the adventure. We went back later to do the boat trip which was definitely worth doing. We hadn’t read the stories and didn’t know any of the characters before going to the park but it didn’t take long to pick up the woodland creatures that inhabited Bewilderwood and the kids were soon immersed in their world. After a play in one of the treetop play areas we took part in the storytime which the kids loved and could be involved in. Noah at 4 years old loved dressing up and going on stage but surprisingly Ethan who is 6 was happy to just watch. This provided a great overview of the story and we learnt more about Mildred the Crocklebog, Swampy and the Thornyclod Spider to name a few. The play areas are big enough and build for adults to join in too so it was great to play along with the kids. The slides were actually quite fast and a bit scarey but the kids absolutely loved them! As well as slides there were zip slides for the daring (Ethan loved these) and also a zipslide inspired slide for younger children with a child’s swing as the harness. So Noah was in his element here as he didn’t really fancy the full experience! This is a theme park with a difference. It is fairly small in size which is a definite advantage. It was small enough to feel cosy and not too overwhelming but big enough to feel like you can easily fill the whole day and still want to go back for more. I would say the ideal age range for it would be 4+ and there isn’t really an age limit as adults can join in with the playing. No reason for mum to be left standing holding the coats here! The park is really well thought out and the clever details are fantastic such as the Thornyclod spider’s tree full of shoes (for all his feet!). As well as the rope bridges and slides there was a great maze which led to steps up to more slides. I raced the kids to the centre and, even though they had their dad to help them, am pleased to report I won so this possibly proves girls are indeed best! We also took part in a parade where the children were involved in choosing an intrument and then following the leader (locomotion style) around the forest where familiar book characters appeared as puppet to say hello! This went down really well and was great fun to cheer up the drizzly day. You could also make your own crown for the parade from the craft activities available. The staff at Bewilderwood really deserve a mention as everyone we encountered was friendly and helpful which is more than can be said for some other popular theme parks! There are three places to get food from. The Munch Bar sells hot food – jacket potatoes, sausage sandwiches and stew as well as sandwiches, cakes and drinks. The Cosy Cabin and Snack Shack mainly sold drinks and cold snacks and sandwiches. It cost around £3 for a sandwich and £4 for a jacket potato with a filling so it is reasonably priced. There is also a picnic area if you take your own food. It was a damp drizzly day when we were there so we opted for jacket potatoes and chocolate muffins and they were really delicious. We had a wonderful day out and will definitely be returning here in future years to get more fun from it playing together. When we were leaving we bought a CD of the stories to listen to in the car (narrated by the author) so next time I think the boys will have an even more magical time as the story is brought to life for them to play in! 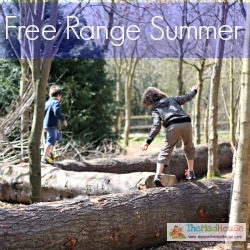 Joining in with The Gallery where the theme this week is Play, Free Range Summer and Country Kids. Disclaimer: We received free admission to the park but all views and opinions are unbiased and our own. 15 Responses to Supporting Play at Bewilderwood! That looks like fantastic fan! I love getting outdoors to play. Wow it looks amazing and such a great place for kids . Looks like you had an amazing time. It looks amazing and the little tree houses are so cute! That looks like a fabulous place for little ones…and grown ups! I wish I had spotted that The Gallery was play this week I could have joined so easily! I love the look of bewilderwood, what child wouldn’t have a great time there? Three cheers for National Play Day, though that may be everyday here on the farm! Thank you for linking up to Country Kids, a perfect post. wow, that looks like a great place. I want to go! This place looks such fun! Wow, what a great post, need to check out this place.